10,694 others viewed this post. 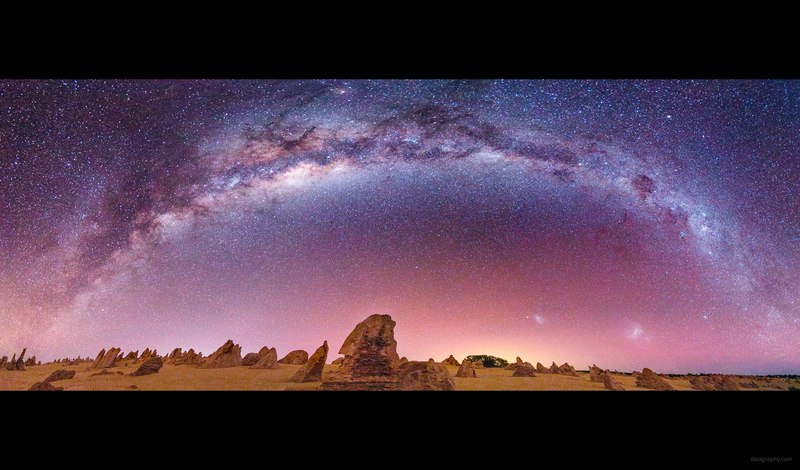 Here’s a 180 degree panorama of our home galaxy stretching over Western Australia, with the glow of Perth city over the horizon. 9 photos stitched together each 25 seconds @ f.28 / ISO 1600 with a Canon 70D DSLR and Tokina 11-16mm lens. These kinds of photos weren’t possible only 10 years ago with consumer grade digital cameras but a quiet revolution has occurred allowing better low-light sensitivity. Film wasn’t much better and a shot with this brightness would have needed 15-20 minutes of exposure time, completely blurring the foreground. We live in a period where technology is giving us unrivalled views of space from the earth as long as you can get far enough from the glow of the same human progress.